HA NAM (VNS) — Ammonia in groundwater in the northern Ha Nam Province exceeds permitted levels by hundreds of times, according to officials of the provincial Department of Natural Resources and Environment. Water testing conducted on 15 water samples by the department last December revealed that ammonia contamination in groundwater was found at numerous locations in the province. Further, the concentrations of ammonia in Bo De and Boi Cau communes in Binh Luc District were 700 and 600 times higher, respectively, than allowable limits. 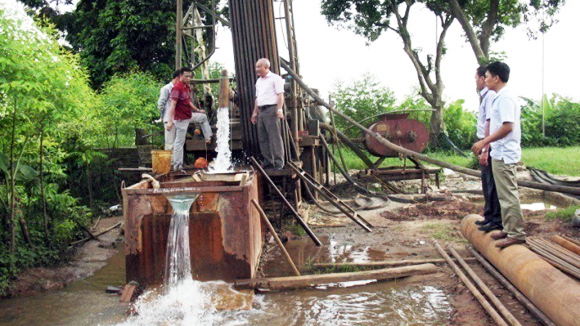 The districts of Binh Luc, Duy Tien, and Ly Nhan have reported the highest levels of ammonia concentrations in groundwater, the department said. Viet Nam's standards stipulate that water with an ammonia level of below 0.1mg per litre is safe for consumption. A higher level, though, has been associated with causing cancers, said officials. The Department of Natural Resources and Environment has instructed the Centre for Environmental Monitoring to conduct water analysis twice a year. The results must be publicised so that responsible agencies can introduce effective measures to eliminate the contamination. Local authorities will also call for support from international organisations to stop the contamination of the ground water. Meanwhile, residents are advised to use rain water for their daily consumption. Chemicals are now being used to treat ammonia-contaminated water in Ly Nhan District's Nhan Khang Commune medical clinic, but they can not be widely used due to their high costs. Data shows that almost 82 per cent of the local population has been provided with safe water.